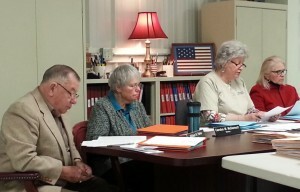 (Carthage, NC) June 8, 2015- Responding to a record 524 voter registrations challenged by Pinehurst residents Carol Wheeldon and Dee Park, the Board of Elections will hold a probable cause hearing on 185 cases, here, Tuesday at 9 A.M.
As part of the group’s ongoing research, they contacted more than 1,400 households with an unusually high number of voter registrations in order to learn which voters were no longer there. At Tuesday’s hearing, Mrs. Wheeldon will present VIP/VIP’s evidence of voters her group believes are no longer living at the address at which they are registered. While not actively looking for it, the group believes their actions will lessen the opportunity for a certain type of vote fraud. The 1993 National Voter Registration Act, (or “Motor Voter”) mandated a convoluted list maintenance procedure that also allowed private groups to sue, at no cost, if any voters were mistakenly removed. As a result, 22 years later, VIP-NC identified 739,041 missing persons on the state’s voter rolls.